Diffusion Pump oil is of two types – Silicone and Hydrocarbon. Most people these days prefer silicone DP oil because of the following reasons. 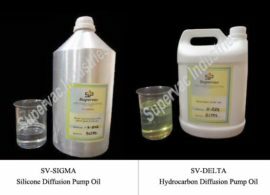 * Good quality silicone diffusion pump oil will have a high vapor point and therefore deliver a higher vacuum level. * Will be thermally stable. * Compared to Hydrocarbon oil, silicone DP oil will perform better over long periods of time with little to no degradation. * This oil is also relatively safe from the standpoint of toxicity and flammability. Diffusion pump oil is one of the costly consumables in a Metallizer. With a few precautions, its life can be prolonged considerably and much money saved. 1) Never open the pump when the oil inside is still hot. Doing so will affect the viscosity of the oil – it thickens and eventually turns into gel form. 2) Care should be taken to top up the oil in the pump in a timely manner. In the absence of topping up, the reduced quantity of oil will accidently over heat and in extreme circumstances, can even crystallize into blue-grey powder or crystals. 3) To avoid having the oil migrate into the vacuum chamber, a cold cap should be fitted at the top of the nozzle assembly inside the diffusion pump. This cold cap condenses the vapor in that area. 4) A concentric circular chevron baffle should be present at the mouth of the pump. It allows air molecules to wander in, but traps the heavier oil vapors as they try to escape. 5) Faulty gauges for pressure/heater too, can cause accidental overheating of the oil or the oil not getting the required heating. Check that all the gauges are functioning properly. 6) There should be no gross vacuum leaks as this will cause the pressure to drop. In a lay man’s language, this means that from some point air is getting inside the pump, not letting proper vacuum to form. Such leaks can be plugged by applying silicone vacuum grease to O rings and joints. 7) Keep track of the water flow through the cooling lines. Check the inlet and outlet water temperature as well as the flow rate. Lines can become clogged or corroded over time. 8) Often back streaming of contaminants from the vacuum chamber takes place causing the oil to form sludge. This can also happen if the Rotary vacuum pump is letting its vapors to escape into the diffusion pump. This is preventable by installing filters above the chevron baffle of the diffusion pump as well as on the line in between the rotary and the diffusion pump. 9) Silicone diffusion pump oil starts to decompose if it comes in contact with even trace elements of alkali metals (e.g., sodium, potassium, cesium etc.). Use of the latter should be avoided in the presence of silicone DP oil.